I like a bit of bling. There’s nothing that makes me feel more like Carrie Bradshaw than a nameplate necklace and plane ticket to NYC. I was given a sold silver name necklace for my 21st birthday and have treasured it ever since – although it does make for some interesting introductions when people start nattering away to you using your name, and you have no clue who they are! 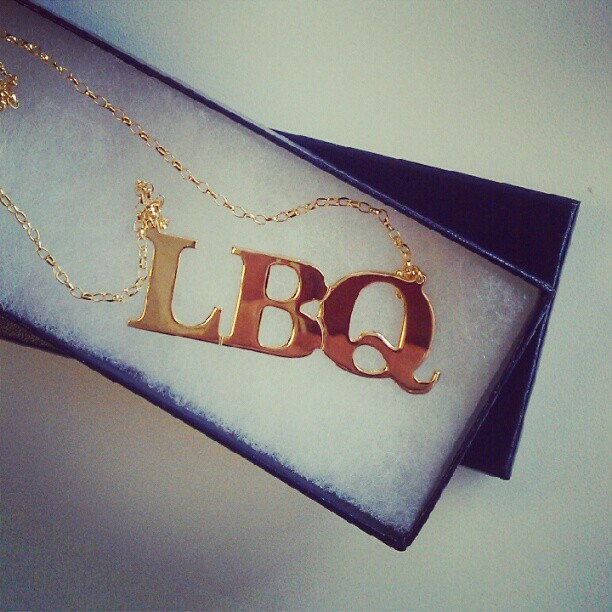 I was contacted by Jewellery Personalised to find out if I was interested in them making me a necklace with my blog namesake on and I jumped at the chance to be adorned with ‘LBQ’. A couple weeks later this arrived in the post to a round of ‘oooohs’ and ‘aaaahs’ in the office. It’s blingtastically beautiful. The necklace is solid gold (9ct) and quite a bright colour, featuring an 18 inch chain and quite a heavy ‘LBQ’ chunk of metal. The letters were much bigger than I imagined, but that’s what I love about it and makes it stand out. Being really comfortable to wear and matching everything I own, the nameplate makes an impact and has had comments from everyone in the last couple of days. I know how much personalised jewellery costs and what poor quality it usually results in, but this necklace was nothing short of a delight. Although not cheap as chips (coming in around the £79 mark) it’s a lot cheaper than what you’d expect to pay elsewhere for similar quality (about double that price.) Here’s a picture of it on while I was hanging out with Daisy Lowe yesterday (more on that later,) so it’s safe to say I’m hearting this a lot right now. That is totally awesome! I think Skin Scrubs deserves one in silver at some point! I love that.. it's really, really pretty! I think silver is much more attractive with this nameplate. But it looks pretty still.